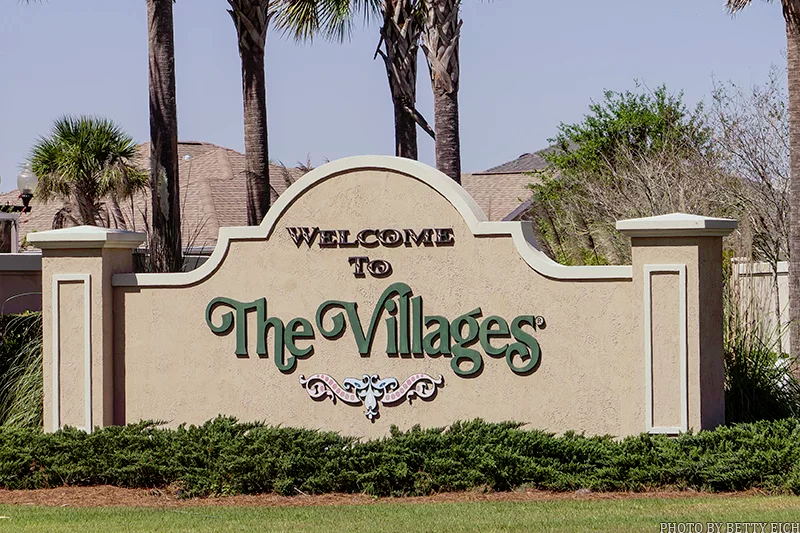 The Villages Florida is one of the largest age-restricted active adult communities in the state - as well as the world. What started as a small neighborhood in 1978 has blossomed into a sprawling community that will eventually be home to an estimated 56,268 households of residents aged 55 and better. The Villages Florida spans three counties, three zip codes and over 20,000 acres. The entire community is connected by over 100 miles of golf cart legal streets and trails. This 55+ community is an entirely self-sustaining town complete with retail establishments, restaurants, banks, post offices, healthcare centers and countless recreational amenities. Residents of The Villages, known as Villagers, have flocked to the community from every state and several countries to be a part of what is boasted as Florida's Friendliest Hometown. The community has drawn retirees from around the world with the lure of warm weather, quality ranch homes and free golf for life. This community in central Florida has appealed to mature adults because it offers a lifestyle unmatched by any active adult community in the country. In fact, every week a 50-page newsletter and activity guide highlights all of the various clubs, activities and events for the week. There are more amenities per capita in this active adult community than any city or age-restricted neighborhood in the country. The community is designed around the notion that every resident should have simple and convenient access to the various amenities. To accommodate this there are a combination of town squares, retail plazas, golf courses and recreation centers spread throughout the development. This 55+ community features three town squares that provide residents with numerous amenities and recreation options in each square. The developers felt that the key to a great community required a special place to gather with friends and socialize with neighbors. Spanish Springs Town Square, Lake Sumter Landing Market Square and Brownwood Paddock Square offer free nightly entertainment 365 days a year. Plus, a colorful assortment of retail shops, restaurants, movie theaters and cafes provide the town squares with a warm and inviting atmosphere. The Spanish Springs Town Square is reminiscent of the old southwest with its storefront shops and fountains decorated in southwestern flare. Spanish Springs Town Square has many inviting attractions including a hotel, more than a dozen restaurants and over 30 retail establishments. The Church on the Square is a beautiful southwestern style church that hosts a variety of musical productions that include choirs, quartets, gospel groups, opera and more. Katie Belle's is a resident only, two-story western-style opera house that provides great dining and dancing every night of the week. The square's movie theater, The Rialto Theater, plays all of your Hollywood movie favorites throughout the year. Lake Sumter Landing Market Square is a charming small-town themed square nestled on the shores of Lake Sumter. The square features several dozen retail shops and restaurants that overlook the square. The lighthouse is also a beautiful landmark that signals fun, entertainment, and great food in the area. Residents can take a scenic boat tour of Lake Sumter and hear about the lake’s history while watching the sunset. Lake Sumter Landing Market Square is also home to the Old Mill playhouse movie theater. The square also features live acts and nightly entertainment every night throughout the year. Brownwood Paddock Square is the newest area of the community as of late 2013. The square resembles a cattle town and allows residents to get a glimpse of what it was like for the first settlers in Florida. There are a variety of great opportunities in Brownwood Paddock Square, such as the Barnstorm Theater playing the latest Hollywood movies, City Fire restaurant, an athletic club, and a barber and beauty salon. The log cabin on Paddock Square features free nightly entertainment throughout the year. With all of these great amenities nearby, it’s easy to see why so many residents never want to leave. There are amenity centers spread throughout this age-restricted community that currently include eight regional recreation centers, 17 village recreation centers and 25 neighborhood recreation centers. The regional recreation centers host the largest array of amenities and generally include a fitness center, hobby and craft studios, meeting rooms and ballrooms. The regional recreation center also offers a variety of swimming pools known as sports pool where lap swimming, water aerobics and water volleyball are held. There are also various sport courts such as tennis, bocce ball, shuffleboard, pickleball and basketball. The 17 village recreation centers throughout the community typically include a small clubhouse with meeting rooms, billiards, catering kitchens, bocce, horseshoes, shuffleboard and family friendly pools. The 25 neighborhood recreation centers are conveniently located in most neighborhoods and include adult-only pools plus bocce ball, shuffleboard and horseshoes. The unique mix of recreation centers spread throughout the neighborhood ensures that residents always have simple and convenient access to their desired amenities. In addition to the recreation centers, there are also countless other desirable amenities within the community including tennis, pickleball, bocce ball, shuffleboard and basketball courts. There are several catch and release fishing lakes and nine softball fields that play host to over 200 softball teams. A polo field with grandstand seating is a particular favorite for many residents, especially because it is nestled near Ocala in central Florida, the acclaimed "Horse Capital of the World". Nearly every imaginable amenity can be found in this 55+ community, including two bowling alleys, a library, woodworking shop, numerous hobby and craft studios and RV parking. There are ten places of worship in the community providing Catholic, Protestant, Methodist and Jewish services. The Villages Regional Medical Center and other healthcare centers offer medical testing, diagnostics, treatment and rehabilitation. The Savannah Center is a large southern-themed auditorium with stadium-style seating. It hosts many big name performances, touring shows, guest speakers, orchestras, comedy acts and local talent. Golf enthusiasts will find a golfer's paradise in this active adult community. Residents enjoy free golf for life at any of the 36 executive courses as well as 12 country club courses. The Villages also offers a state-of-the-art golf academy. Golfers of all levels can take group or private lessons so they can improve their game with golf instruction or just learn the basics. Plus, for nominal fees, residents can also play at any of the 10 championship golf courses including the famous Palmer Legends designed by Arnold Palmer or the Nancy Lopez Legacy Country Club. Residents can experience the best of golf while enjoying all of its country club-like amenities. Most of the executive golf courses are 9-hole courses with manageable par 3 holes with the occasional par 4 or par 5. The executive golf courses are perfect for all levels of golf players. They have three sets of tees that can cater to the most serious golfer to the recreational or beginner golfer. Serious golfers can join any of the 10 championship courses for free. Membership to the championship courses provides discounted golf fees and preferred tee times. Life is a never-ending assortment of fun and activity. Ask any Villager about their experiences in the community and you are sure to get an earful about how exciting it is to live The Villages lifestyle. Many compare it to being a kid all over again, others say it is like living in a resort all year round and some remark it’s like going back to college - without the responsibility of homework or attending class. There are an estimated 1,800 or more different clubs and groups that represent almost any imaginable interest or activity. A new recreation, activity and event newsletter is delivered to the residents each week. This 50-plus-page document highlights everything the community has to offer to its residents. Arts and crafts enthusiasts can partake in activities such as ceramics, painting, quilting and woodworking. Dancers can take their pick of tap, jazz, line dancing, square dancing, ballroom dancing, ballet and more. Health nuts have a never-ending assortment of fitness classes, aerobics, yoga, power walking and weight training. If your interests are in music and theater, you might consider joining a choir group, band or theatrical group. This community has an assortment of social clubs that represent many interests and ethnic groups. These clubs have resident groups from all 50 states and several countries. This age-restricted neighborhood also has special interest clubs for things like clowning, bird watching, collecting, astronomy, photography, genealogy, and scuba diving. For the sports enthusiasts, there are countless sports teams, leagues and tournaments in everything from tennis, pickleball and golf to softball, biking and bowling. Regardless of your interests or passions, you will surely find other Villagers who share your zest for getting the most out of life. The community also hosts its annual Camp Villages, an eight-week summer program filled with fun activities for residents and their grandchildren to do together. The program consists of kayaking, soccer, full swing clinics, line dancing, putting clinics, kite making, water sports, cooking demos, and more. Residents and grandchildren can spend quality time doing fun activities or learning new skills, but most of all they can enjoy an unforgettable summer sharing memories together. The real estate market includes many types of housing options ranging from intimate villas to luxurious single-family homes with golf course views and everything in between. There is a housing type, size and price to suit the needs of almost any active adult buyer. Since the community started construction in 1978, approximately 100 different floor plans have been offered. The floor plans are divided up into seven different categories including patio villas, courtyard villas, cottage-ranch homes, designer homes, and premier homes. Each series offers a unique set of included features and available upgrades. There are smaller, less-expensive homes designed for simplistic living at a reasonable price or larger units, which offer highly upgraded finishes tailored for residents who want luxury living. There are both new construction and pre-owned resale homes in The Villages. Many of the resale homes are highly desirable for their reasonable prices and already included upgrades such as landscaping, window treatments, screened lanais and other popular add-ons. There are a variety of pre-owned resale homes for sale in The Villages Florida, which can provide you with the ideal opportunity to find the home of your dreams at the lowest possible price. Prior to purchasing real estate in this active adult community, it is advisable to entertain all of your options by previewing the many available resale homes. The Villages is located in Lady Lake in the heart of central Florida. This ideal location places the community within 90 minutes to some of the most desirable attractions in Florida including Tampa, Orlando, the Gulf of Mexico and Atlantic coast beaches. There are many popular surrounding destinations including the quaint lakefront towns of Leesburg and Mount Dora 20 minutes south. The Ocala National Forest 20 minutes to the northeast offers fun activities like canoeing, boating, fishing, hiking and biking. When grandchildren come to visit, there are many great nearby attractions like the Florida Horse Park, which offers fun rodeos, tractor pulls and 4H shows. Places like the Kennedy Space Center, Disney World, Sea World and Universal Studios are accessible in less than 90 minutes. Closer to home, this community is surrounded by an enviable array of shopping and dining outlets. There are approximately 200 retail stores and 60 restaurants accessible via golf cart in and around this community. Options range from local boutiques to name brand favorites and chain stores. Whatever your interest, this 55+ community in central Florida has everything to offer active adults and it's only a golf cart ride away.